When I learned that Alex Payne, a Twitter developer, is a fan of Unclutterer, I immediately asked if he would be interested in writing an article for our site. Alex has vast insight into the workings and possibilities of Twitter, and the following article explains how it can be used to help unclutter your communications. Working on Twitter, I see all sorts of interesting uses of our service. Twitter is a great way to keep up with friends and family, but it can also be a great way to keep up with everything going on in your life without cluttering things up with sticky notes, emails, and other junk. Clever developers have come up with extensions to Twitter’s functionality purpose–built for notes, events, reminders, and even whom you owe a beer to. Most of these Twitter “bots” work the same way: you follow a given user on Twitter, then you send commands to that user. Sometimes those commands are sent in public and sometimes they require a direct message (“d username this is my message”). Either way, you can interact with bots on the Twitter website, via SMS or IM, or with a client like Twitterrific. TwitterNotes is a superb replacement for sticky notes or a notepad, especially when you’re on the road. After following tnotes on Twitter, just post an update prefixed with a plus sign like, say, “+ take out the trash later.” Don’t want everyone to see your notes? Try “d tnotes do super secret stuff.” You can then retrieve your notes on the TwitterNotes site, or subscribe to a feed of your notes. The GTDers out there will appreciate TwitterNote’s tagging abilities. There are a couple of good options if you need to keep track of what’s coming up on your calendar. Timer is the simplest program: just send it a direct message like “d timer 15 check the laundry” and you’ll get your reminder back in 15 minutes. If you need something more full-featured, the popular online task management service Remember The Milk has excellent Twitter integration. Ever forget who you promised some liquid appreciation to? You can use recently-launched Foamee to keep track of your sudsy debts. After following ioubeer, just send updates like “@ioubeer @crystal for answering Twitter support requests.” Collect your IOUs on the Foamee site when you’re back at your computer. You can find a host of Twitter bots at retweet, a blog dedicated to finding the best in bots. You’ll also find other useful ways to interact with Twitter on our downloads page and on the Twitter Fan Wiki’s list of apps. It’s easy and fun to put Twitter to work for you, and always surprising what you can do with a simple text message. I like this space because of the way the windowsill is used as a shelf for the desk. The contents on the sill personalize the space, but keep the work surface clear. Also, UberTechnica was another brave soul who dared show us the uncluttered drawers of his desk. I live in a two bedroom home, and my husband and I use our second bedroom as a home office/television/media room. The room is pretty tiny and there isn’t even enough space in it left to fit a blow-up mattress. So, whenever we have house guests, they are relegated to our living room and its foldout couch. We have enough storage space in our bedroom closet to store the extra pillows, sheets (it’s a different size than our bed), and blankets for the foldout couch. We decided, though, to store these items all together to make assembly and storage simple and uncluttered. We use two XL Ziploc Big Bags (one for the pillows and one for the bedding) for storing these items. One of the XXL Ziploc Big Bags might hold all of the materials in just one bag, but these weren’t available when we went shopping. Additionally, we have a clear plastic box in our guest bathroom with items people commonly forget while traveling. It’s labeled “For our Guests” and takes up relatively little space beneath the vanity. Most of the items in the box are travel size and came free from the dentist or were hotel samples we collected on vacations. Keeping supplies for house guests contained makes life uncluttered for you and leaves your guests feeling like you’re a considerate host. Additionally, it makes accommodating unexpected guests simple because you’re always prepared for them … well, at least prepared for their sleeping arrangements! This installment of the Unclutterer Gift Giving Guide explores the virtual world of online subscriptions. Subscription services like Consumer Reports, Lexis-Nexis, and a flickr Pro account make great gifts. As opposed to physical subscriptions, these online services keep clutter out of your gift recipient’s home. A subscription to Audible is a great option for book lovers on your list. Music lovers might enjoy a gift certificate to iTunes. For movie enthusiasts, you might consider Amazon’s Unbox or TiVo-Unbox pre-payments. In the past, I also would have suggested The New York Times and The Wall Street Journal. The New York Times is now free to the public, and rumors are flying about The Wall Street Journal heading that way, too. So, those are off the list. Flower of the month and fruit of the month clubs are subscriptions that allow you to give something tangible throughout the year, but impermanent additions to a home–and you can order them from the comfort of your home. When you are trying to keep clutter out of your gift recipients’ homes, consider virtual gift options. When I was much younger and would visit my grandmother, she used to make me funnel cakes. She was quite the amazing woman because she managed to make them without Dean Jacob’s Funnel Cake Kit. It’s unbelievable that she got along without this kit, which includes all that you could ever need to execute the perfect funnel cake. Okay, maybe it’s not so unbelievable. See, my grandmother was able to use a regular funnel that wasn’t Dean Jacob approved. I’m not sure Dean has a secret mix or the funnel contraption that he employs can pour at an alarmingly efficient rate, but the kit includes a bunch of things you most likely have in your kitchen already. Basically, all you need is a funnel and some metal tongs. 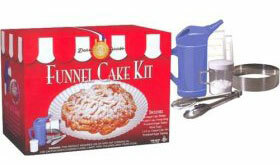 The mix is included with the kit, and, sorry to ruin the surprise, funnel cakes are simply deep fried pancake batter. So, save yourself the money and make your own funnel cakes without the help from Dean Jacob. As the image describes, the 2 + 1 piece can serve as a bed, sofa, or two chairs and a table. I love the multi-functionality of this piece of furniture. My father is tough to crack. My wife and I constantly ask my mother what to get him for his birthday, or in this case, the holidays. She never gives us anything to go on, so we generally fall back on some kind of golf gadget or a fashionable golf shirt. My father golfs a lot and he has his fair share of golf equipment, so this year we are not going to add to his golf clutter. Instead, we are going to give the gift of an experience. The gift could be anything from a gift certificate for his favorite restaurant or a bunch of passes to the local movie theater. Pampering: Purchase a gift certificate for a facial, massage, pedicure or manicure. Or, go for broke, and get an all inclusive spa treatment package. Events: Give the gift of the performing arts. Purchase tickets for a play, a concert, or a musical. If the person isn’t into the performing arts they may really enjoy some tickets to a sporting event. Food: Either go the restaurant gift certificate route or purchase some gourmet food from any number of gourmet food sellers. Adventures: If the person you are buying for is adventurous, try to set up a river rafting trip or a hiking trip. Consider giving them the unforgettable experience of a skydiving lesson! Obviously, these suggestions are limited by your budget, but you can be creative and give something that won’t add clutter. Your gift also will supply them with memories to cherish. With the holiday season upon us, what better time to do an inventory of your cupboard or pantry?! If your cupboards are anything like mine, you likely have duplicate canned goods that you can take to a local charity in time for holiday feasts. Over the span of a year, canned goods seem to accumulate at the back of the cupboard leaving me with multiple items of the same thing. It seems to be inevitable. So, take some time, unclutter your cupboards, and donate your extra cans to a worthy cause. (Be nice, too, and check to make sure that your cans haven’t passed their expiration dates!) On your way to the donation center, you may want to stop at the grocery store and buy some extra non-perishables for good measure. If you love to wrap gifts and watch people unwrap them, then gifts that can be consumed might be your preference. Giving others gifts that can be used up and are necessary are ways to fill the need of giving something tangible during the holidays. Kitchen idea #1: Ziplock bags, aluminum foil, parchment paper, wax paper, paper towels, sponges, and a silicon oven mitt. Kitchen idea #2: A collection of quality, fresh spices from a local merchant or a reputable online vendor (like Penzeys). Garden idea: Bulbs and seeds for flowers or a garden. Shower idea: The recipient’s favorite shampoo, bath bombs (like the ones at Lush), luffa, scented shower gel, and exfoliating scrub. Garage idea: Motor oil, windshield wiper fluid, large garbage bags, leather palmed work gloves, and a gift certificate to the local bicycle shop covering the cost of a spring maintenance. Gifts that can and will be eventually used are terrific ideas for people who enjoy giving gifts that can be touched and opened. Feel welcome to add to this list with your own ideas in the comments section! When people ask me what is the single best organization tool I own, I do not hesitate to say the Fujitsu ScanSnap (I own a Mac version, but there is also one Vista compatible for the PC). I purchased it while doing research for Unclutterer’s Paper clutter begone! series, and continue to be fully satisfied with the purchase. It is definitely the single best organization product I have purchased this year. Until I purchased it, paper clutter was my biggest thorn in my side. My desk was stacked with piles and piles of papers to be sorted and filed. My filing cabinet was crammed to its breaking point. My office was a complete disaster. 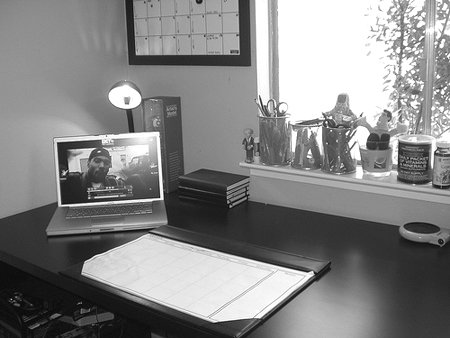 The ScanSnap actually changed the way I do work and manage my home office. If you’re looking to give the ultimate organization gift this holiday season, I strongly recommend considering the Fujitsu ScanSnap (Mac and PC). Also, if you don’t have one, you may think about sneaking it onto your list! One of the features I like best about this workspace is how the books in the room are only those Natasha needs for her current semester of school. I also applaud Natasha for posting a picture of the inside of her desk drawer. The Unclutterer staff would like to wish everyone a happy Thanksgiving! On our lists of what we’re thankful for this year is you, our Unclutterer readers. We’ll return tomorrow, stuffed, with our regular postings.